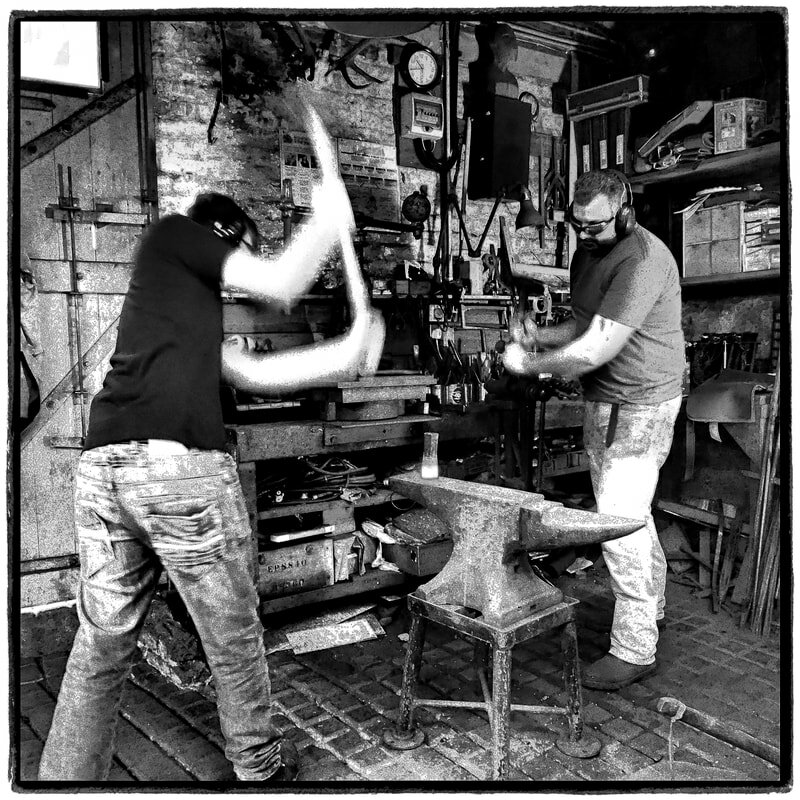 Caimbeul's Forge is run and owned by award winning Artist Blacksmith Doug Campbell AWCB and produces a wide range of contemporary and traditionally made hand forged steel work. With the forge being located in Watford and Bushey area of Hertfordshire, Doug mainly designs and produces pieces to commission for private clients. He also maintains his position as "the local blacksmith" and does repair and restoration on existing metalwork. If you have an idea for a commission or have a query, please get in contact. The forge is open Monday - Friday, 9am-5pm & Saturday, by appointment only. Please note that we occasionally have to do site visits during opening hours so if you wish to visit the forge we advise phoning first to ensure that we are there. Our Facebook, Twitter, Instagram and Pinterest pages are regularly updated with what's going on at Caimbeul's Forge including photos of current work, events we will be attending and photos of daily life in the forge. Please click on the links below to visit our other sites. Doug is now an AWCB! In May 2016 Doug was honoured to be awarded a Diploma of Merit, becoming an Associate of the Worshipful Company of Blacksmiths and enabling him to use the qualification AWCB after his name. He was formally presented with his award at the Worshipful Company of Blacksmiths Awards Luncheon in October 2016. He is now working towards becoming a Fellow of the Worshipful Company of Blacksmiths (FWCB). Please click here for more information on the Worshipful Company of Blacksmiths. Whilst doing our Christmas exhibition 2015 at Lark Lane Artworks in Liverpool, Doug was approached about being a part of "Everyday Extraordinary People - In This Life", a series of short videos about a person's character and inspirations in following their chosen interest in life. Of course, he said yes! To find out more about In This Life and to watch the short videos of the other people and their interests, please visit the In This Life Youtube channel or their Facebook page.